Voice | What is Voice? What Is Voice in Grammar? Voice is the term used to describe whether a verb is active or passive. In a passive sentence, the verb is said to be in the passive voice. Similarly, the verb in an active sentence is said to be in the active voice. The voice of a verb tells us whether the subject of the verb is acted upon or is acting. How do you decide when to use the active voice and when to use passive voice? Well, both are grammatically correct. However, the emphasis of the subject and object changes. Below is a list of advantages for both which will help to guide your decision. Active sentences are more engaging for the reader. Active sentences are often less confusing and less ambiguous. Active sentences allow you to express an authoritative tone. Passive sentences allow the subject to avoid responsibility for the action. Passive sentences can show a neutral or objective tone. Passive sentences are used when the subject is obvious, unimportant, or unknown. Passive sentences allow you to shift the focus of the subject. What are verbs? What is the subject of a sentence? What is the object of a sentence? What is the active voice? What is the passive voice? What is an active sentence? What is a passive sentence? King John signed the Magna Carta in 1215. He placed limits on his powers and proclaimed certain liberties. In 1215, the Magna Carta was signed by King John. He placed limits on his powers and proclaimed certain liberties. There are two important things happening in our second example. First, we've made the Magna Carta the subject of the sentence to highlight what we're talking about. Second, we've ended our sentence talking about King John. This is important because when the reader starts the second sentence, it flows to He. It's very clear we're talking about King John because He is fresh in our minds. Grammar checkers will often highlight passive sentences like they're errors. This happens because they were written for the business environment, where bosses often demand clear, direct language. 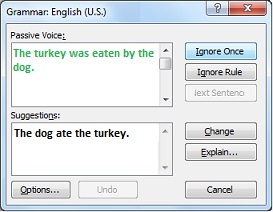 However, there are advantages to the passive voice too, so don't be bullied by your grammar checker. If you like your passive sentence, ignore your grammar checker.